Here we are in the Brett Valley, the prettiest part of East Anglia, I think. Nearby Lavenham and Kersey attract all the tourists, but I wonder how many of them ever make it out into these deliciously lovely villages that huddle in the gentle hills between Hadleigh and Stowmarket? A mile or so from its little sister Brent Eleigh, this village has the grander church; but, perhaps, the less interesting one.It certainly has a splendid setting: this was one of the great wool-producing villages of the Brett Valley in late medieval days, the busiest and richest part of England in the 15th century. Up from the village high street, St Peter's powerful 15th century tower can be seen for miles around, and it is a pleasant foil to the mightily sombre St Peter and St Paul, Lavenham, a couple of miles beyond it. 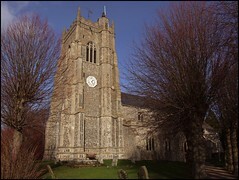 St Peter's tower would perhaps be more typical of the churches of the nearby Stour Valley, with the stair turret climbing beyond the battlements. It certainly makes itself known - in this hilly country, every view is like a painting. The tower sits close to the road, with a fascinating west doorway carved with little animals. There was a huge rebuilding here in the late 15th century, as you might expect. 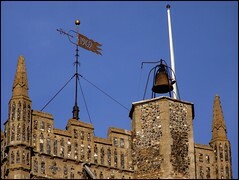 The top of the tower has deliciously decorated flushwork and a weather vane dated 1969. The graveyard constrains the building tightly to south and north, but then sprawls away to the east. 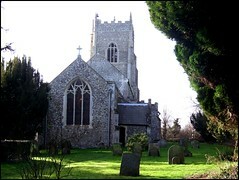 Looking back, you can see that the long chancel is entirely 19th century. You enter through the south porch. While this part of Suffolk is well-known for some deliciously atmospheric and historically significant interiors, this is something different. There was an overwhelming Victorian restoration here in the full flush of Anglican triumphalism, leaving a fairly urban and even slightly anonymous feeling, although this is obviously a well-loved and cared-for place. It would have been interesting to see this church in the 18th century, when it was full of box pews - the door of one of them survives in the south-west corner, labelled Free for Women. Also at this end is an elegant Early English tub font on pilasters, retaining its Perpendicular font cover. The nave was rebuilt at the time of the tower, retaining an arcade from an earlier church, but otherwise being all of a Perpendicular piece. There is a massive Queen Anne coat of arms above the chancel arch, almost of a size with that at Mildenhall. In one respect it looks rather out of place, given that we are used to seeing them at the west end, but of course is in its original place; they all hung above the chancel arch in the days when the church was considered an arm of the state. The chancel is wholly Victorian in construction and character, and has some fascinating windows by the Ward & Hughes workshop. They depict scenes from the life of Christ - the summoning of the Disciples, the raising of Jairus's daughter - but if you look closely you will see that some of the figures in the scenes have 19th century faces, and are wearing 19th century clothes. These are memorial windows to the figures worked into the scenes, and the brass plaques that name them are also by Ward & Hughes. The best one is the astonishing consumptive figure of Jairus's daughter, who is represented by Winifred Frances Fisher, a 17 year old girl who was suddenly called home in 1892. Her plaque notes that she was Perfected in a short time. She lies on her death bed, her silvery curls flowing across the pillow in a perfect moment of late Victorian sentiment. Rather odder is the figure of her father, in full 19th Century formal wear, who peers curiously from behind the backs of St Peter and St Andrew as they are called on the lake shore to give their lives to Christ.